Come check us out on FB where we have our delicious Belgian Chocolate that is Gluten Free and so much more. It can even be flavored for those wanting that. We have scrumptious soft baked glazed sugar cookies, soft bake chocolate chip cookies, and so much more. 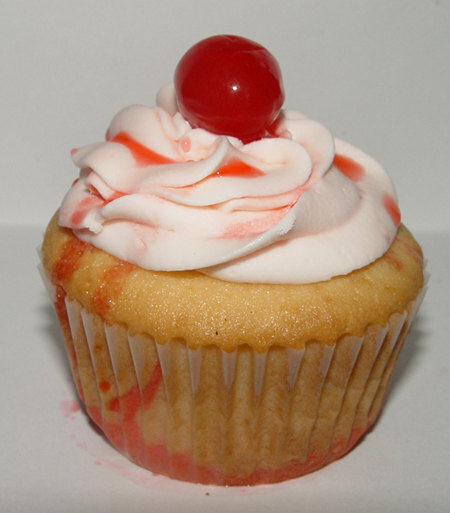 Delicious cupcakes that are customm made for you right here locally. I have found that these do not ship well for me. I just won 5 points on the SuperLucky Button! I just won 5 points on the SuperLucky Button! : Superpoints is a members-only club where you earn great rewards for doing things online like taking surveys, watching videos or shopping. Yay our new cupcake mold will be here tomorrow!!! I'm so excited that our new cupcake mold will be here tomorrow from Pampered Chef!! I can't wait to start making cupcakes in it and then to start offering you a delicious choice of toppings!! I will also be making a special bread that is made in Alaska by the natives. It is delicious and I will start making variations to it. It's healthy yet sweet enough to please even the most picky eater. It is a flat bread the only raises a small amount due to baking powder vs yeast. I know of you celebrate the Days of Unleavened Bread and the nice thing about my special stovetop bread is that it is yeast free accommodating your needs as well during that Special week. Come be a fan of our FB page, Twitter and Pintrest to stay up to day on the latest products we have to offer. We are having another auction Friday Feb. 24 this time for 1 Lemongrass Olive Oil Soap. In a few days you will be able to shop for our products directly from our blog so stay tuned! We will also be adding some favorite shops you can go puchase from. Come be a fan of our FB page where you can purchase directly from. I HIGHLY HIGHLY recommend www.sweetsfairybakeshop.etsy.com on Etsy, lulla, Storenvy, & sweetsfairy.com. I got some cake pops from her and even daughter was begging for more b/c they were soooo good. She has 25% off right now so what are you waiting for? GO ORDER!!! I mean she is AMAZING!!! They were the best I ever tasted ANYWHERE!!!! Go here to purchase them at 25% off w/Code "sweet25". 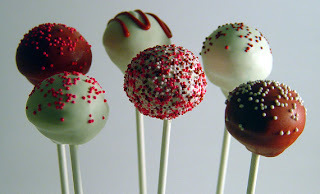 http://www.etsy.com/listing/82596236/one-dozen-decorated-cake-pops The picture is above and boy don't they look yummy? I can't say enough about how nice Jeana is. I am ordering some cupcakes from her for my Niece and her husband. She is even nice enough to create a custom order for me and drop ship it to them. Oh did I mention she is going to them there before Valentine's Day? I mean you just can't go wrong. Look at the picture at the bottom and tell me they don't look YUMMY!! Bid is at $10 Come one everyone this is for a good cause. The family needs help. Okay, I'll sweeten the deal. Choose ANY ITEMS UP TO $10 or less from either/or www.naturalmtnbodycare.etsy.com or www.naturalmtnbodycare.storenvy.com. Come on out bid @Traci Samplervillage & help this family. 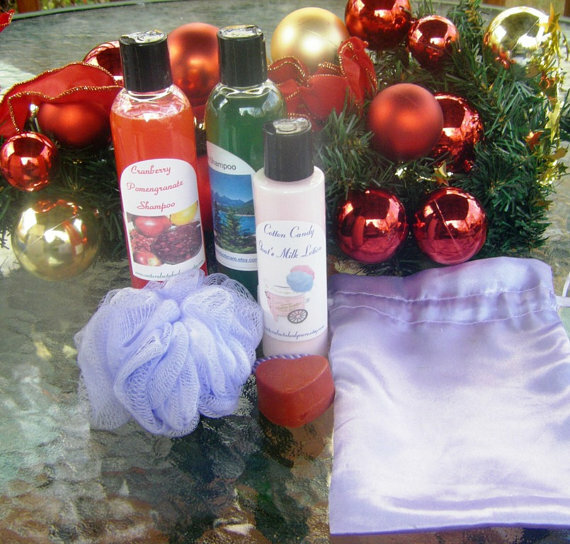 Up for bid is a Spa Gift Set lovingly handmade by us Natural Mtn Body Care. Everything you see is included and you can choose scent/color. Want the gift set for a man? No problem we have masculine scents and can substitute heart for a Shaving Soap. We are offering this up for auction with a starting bid of $5 plus shipping. All proceeds go to a family in desperate need of money. Don't forget to check out my friends auctions too with all proceeds going to the same family. Please comment below with your bid. The winning bid will receive the list of fragrances available (nice and long to choose from). Worldwide shipping! We will gift ship too. Bidding is in $1 increments. Comment with your Paypal email. Auction will stay up through Sunday night. U.S. & Territories $6.00 Priority Mail Shipping. Canada $13.95 Priority Mail Shipping. Canada $9.30 First Class (Winner's Choice). Mexico $13.95 Priority Mail Shipping. Everywhere Else $16.95 Priority Shipping (winner's choice). Everywhere Else $16.31 First Class (winner's choice). Please help this family!! They are almost at their goal & need a little more help! Won't someone please help this family? Anything will help!! Please please help them!!! from her. She is offering 20% off this week. together? Give all you can to help them even a few cents will help. everything helps. Let's make this the year we really show a family that we care!!! to support him. He is a hard worker and a father. all he wants is to stay here with his family. Can you find it in your heart to help? Even a little? Surely we can!! Just a little will help!! on how much has been donated & how much is still needed. Please help them!!!!! 500 Fan Giveaway Starts NOW!!!! Rules: You absolutely must be a fan of our site to enter and to win! U.S. residents only! How to Enter: You get 1 entry for “liking” this post, 1 entry for commenting with your name on this post. 1 entry for each place you share this socially (your personal Facebook wall, your business Facebook wall, Facebook groups, your blog, Twitter, Google+, etc.). Be sure to let us know where you have shared this so that we can give you your entries. You CANNOT enter this contest twice using your personal page and your business page, only the entries from your personal page will count but you will get that extra entry for sharing it on your business page! We will also give you up to 6 extra entries for each photo of yourself wearing our mineral makeup that you post on our wall! Only entries on this original contest post will count. 1 winner will be selected Thursday February 2nd at Midnight MST using Random.org. The more entries you receive, the greater your chances will be of winning. We may give you more opportunities for extra entries so keep an eye out for those! This giveaway is not hosted or endorsed by Facebook in anyway. So any questions or concerns need to be emailed directly to us. If we find that any person is attempting to cheat by using multiple facebook profiles or fake profiles that person’s entries will be deleted and they will be banned from our page and all future giveaways. Thanks and good luck! ♥ Lots of Samples & More plus Free Priority Shipping!!! Wow we wish to thank all our customers! We really just wanted to give a big THANK YOU to all our customers out there! Business has been picking up since we have been blogging and advertising. We owe it all to you our customers! So once again here is a big THANK YOU TO ALL OF YOU!!! It's been a long hard road building our business and the sign that we are doing something right is that we are having repeat customers. We love our customers and greatly appreciate you. That's why we wanted to give you the big thank you!! We have a FB store open but due to a technical glitch it is not open via Facebook right now but can be accessed through the top link below. Don't forget we offer worldwide shipping & free local pickup & delivery. Well the Show was not worth attending I'm sorry to say. There were very very few people there and they weren't the buyers. We did sell a little but now it is time to make room for Fall/Winter & Christmas items so we are running a 25% discount on items left from the Show. There isn't anything wrong with them just need the room in our stock room. Price will reflect discount. We did sell a Berrylicious & a bar of Secrets. The lady that bought it had a hard time deciding what she wanted and finally decided on Secrets which was #5. Even Mom likes #4 Mystery Woman and she is 72. I like it so well I dabbed the last drop on my wrist as perfume before the Show. I just might keep Mystery Woman Perfume. I really like it and everyone who stopped by our table really liked it. Of course it was the women the men went to the table next door to look at the wooden toys. They were handcrafted. Mom bought my daughter a Tic Tac Toe Set from there. Here are pics of our Booth at the Show. Like the Cigar Bands on the soap Bramble Berry? Yes, they are from you guys and work so wonderful with my soap! Thank you so much. It's been a blast doing the Tester Fragrances for Fall SOAP! Berrylicious which was #1 if memory serves me correct faded some in the soap after curing but it is still nice and we fixed it with some berry fragrance we have. We did sell one at the Show. Passion Flower #2 held up in fragrance for CP soap but is taking much longer to cure so I couldn't take it to the Show. Made at the same time as Sunset and out of the same batch of soap but just isn't curing as fast. Not too sure I'm overly fond of it anyway but hey what I don't like someone else might love. Strawberry/Banana as it was originally named then changed to Strawberry Shortcake as the fragrance changed over time as the soap cured was #3 & defiinitely set up early due to the strawberry in it but worked great other than that. the only thing is 1 oz will not fragrance a 2lb loaf to last. You must add more which we did later so it now smells really nice. Mystery Woman #4 smells so good in perfume that I grabbed the last drop to dab on my wrists before the Show. I also made 3 Oval Bars & one Rectangular. My mom who is 72 loves it. It holds it's color well too. Secrets #5 was done in green chrome but naturally changed to green & brown for a nice contrast and did sell at the Show. Decided this could be a unisex bar when I smelled it out of the bottle. Sunset #6 as I named it still smells nice like a perfume but a nice ladies perfume. Not too great a hit in my neighborhood which isn't too surprising with the economy. Posting it on my Facebook Fan Page to see how it goes there and will list on website. Cedar/Mint #7 as it smelled like when I first opened the bottle changed in the cured soap to just Cedar. At least Cedar holds it's fragrance in CP. I was just really disappointed that the mint vanished because it smelled really good together. Would make a good masculine soap now. Not liking the size I cut it into but that is my fault not the fragrance or soap. Cedar/Pine as #8 smelled like still smells nice and strong but then Cedar holds well in CP. I just am not liking the size I cut it into. Oh well that's okay.